Hei alle sammen!! (Hi all) And a good time was had by all!! I have heard this uttrykk (phrase) many times and as I think about our November meeting, I can truly say… And a good time was had by all!! Wow, we had a SUPER publikum (crowd) of about 75 persons for our Soup and Sandwich SUPPER. The soups, sandwiches, and goodies were fremragende (outstanding), our treasury was lifted by your sjeneros (generous) and all-time high donation, our nettverk (networking) was herlig (wonderful), our memorial was gir mening (meaningful), the installation of board members was done with efficiency and forventning (anticipation), and our program was filled with information about our scandinavian heritage which we all enjoyed. Fantastic, Vikingland Lodge #495…no wonder we receive plaques for our prestasjoner (accomplishments), because we are the best. December 2 in the Mall. We also elected to purchase a cake for our December meeting, in honor of our Centenarian, Lois Wisted. 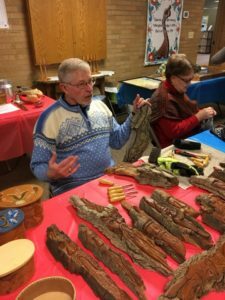 At our December meeting, we eat again…this time it’s PATLEK POT LUCK and I can imagine that we will be treated to some rommegrot, lefse, and all the Scandinavian goodies. Our program will include the installation of the Lodge Board Members for 2019 and we will have a festive Yuletide program. 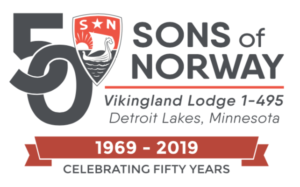 And now, since this is my last monthly newsletter, I want to thank you, the members of the Sons of Norway Vikingland Lodge #495 for your brukerstotte (support) during my years of leadership of this great organization. I have enjoyed working with the board members and the general membership in skaper (creating) new ideas for fellowship and fun, and finding ways to serve others in our lokalsamfunn (communities). lutefisk. And until ve meet again, May da Good Lord protect ya from any and all unnecessary Uff Da’s. Vikingland Lodge Turns 50 in 2019! Starting in January you will begin to hear about our 50th Anniversary year! To commemorate this milestone, we’ve adopted a custom logo design created by the team at Cora+Krist to help us celebrate. Watch the January newsletter for more information on ways we plan to celebrate this milestone. City street in Norway decorated for the Christmas Holiday. Deep within the Norwegian mountains, the town of Røros, Norway, transforms into a magical Christmas market for one weekend, every year. 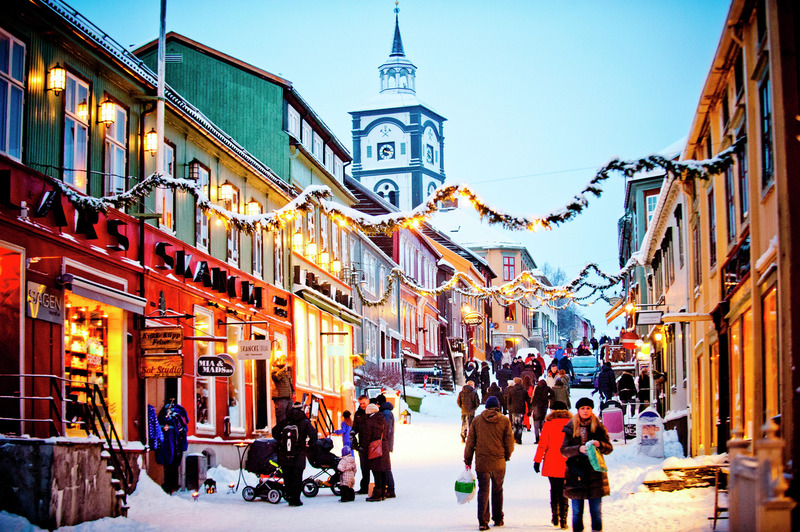 The streets of Røros are lined with more than 60 market stalls, Christmas food and traditional activities. Drawing in hundreds of visitors, Røros offers a wonderful start to the Christmas season. Experience Røros by taking a romantic sleigh ride, exploring the nooks and crannies of the old copper mining town or warm up with some freshly made gløgg. 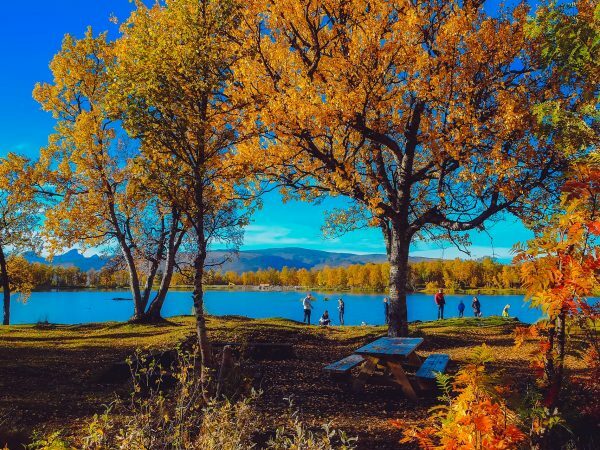 This picturesque, Nordic town was the inspiration behind Disney’s movie, Frozen. Kids can meet the beloved reindeer Sven, build snowmen or try tobogganing. More about enchanting Røros can be found online in the November 2016 Viking. Log in at www.sonsofnorway. com, then access the Viking archive by clicking on the Norwegian Culture drop down menu on the homepage. Hanne Sørvaag had always sung in English. Now the artist is releasing an album in Norwegian. “The texts came so easily. The subject matter became a bit different. And it’s a bit more to the point,” says musician Hanne Sørvaag. She’ll soon be ready with the album “Som om me hørte samen” (As if we belonged together). It’s her first in Norwegian. This is Sørvaag’s seventh solo studio album. The first one came out in 2002. Sørvaag has written several songs for others. This is one of the reasons she spent time discovering Norwegian as a singing language. “I have received a good response to Norwegian songs, but I wanted to do so much. I wanted to make songs in Nashville in the United States. I wanted to write pop with the Swedes,” she told news agency NTB. 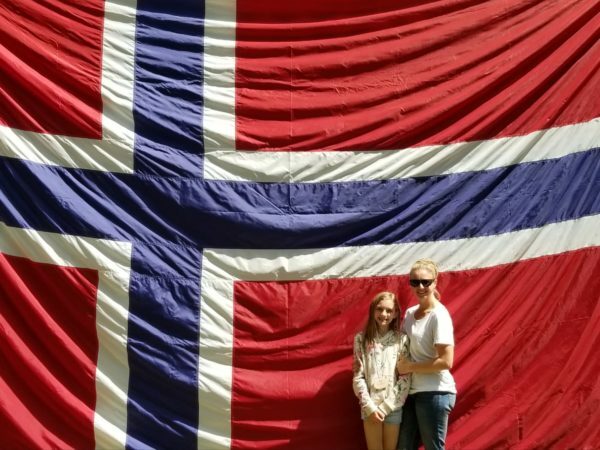 [Norsk Telegrambyrå / Norwegian News Agency] She chose English. That way she could reach the world. Sørvaag wrote the song “My Destiny” for singer Katharine McPhee. It ended up in 2nd place on the Billboard Charts in 2006. The musician also wrote the song “Brief and Beautiful.” It went to number one in Norway. The song was sung by Maria Arredondo. Last year, Sørvaag participated in the TV program “Hver gang vi møtes” (Every time we meet). She sang songs belonging to other artists. “God morgen min kjære“ (Good morning my dear) became really popular. That made Sørvaag change her mind. Nowshewantedtotakeachance on Norwegian. “The ideas began coming to me in Norwegian,” she says. Sørvaag uses her own upbringing in her songs. It can be a bit painful. Her parents divorced when she was four years old. This gave her inspiration for songs. The World’s Best Cheese Is From Norway! 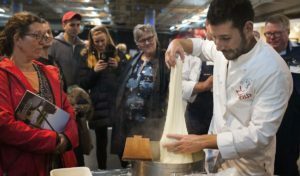 Among almost 3500 cheeses, the local product Fanaost from Ostegården won the gold medal during the World Cheese Awards in Bergen. A brown cheese from Telemark came in second. This year’s winner of the prestigious World Cheese Awards is Fanaost from Ostegården just outside Bergen. Helfeit, Brun Geitost – a brown cheese – from Stordalen Gardsbruk in Tinn, Telemark came in second. 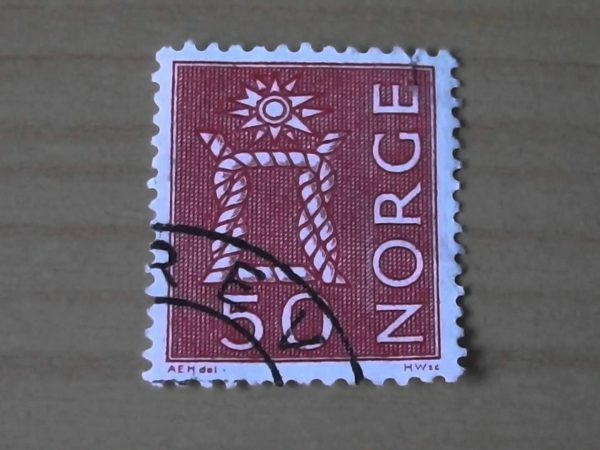 Traditionally, Norway has been known for it’s Jarlsberg and brown cheese. Before the world’s first hybrid battery powered expedition ship sets sail in 2019, Her Majesty Queen Sonja and the Queen Sonja Print Award Foundation will hand pick every piece of artwork to be displayed onboard. The exciting partnership between Hurtigruten and the Queen Sonja Print Award Foundation was announced earlier this year by the Queen, and may also include future collaborations in design and development of joint merchandise, art talks, exhibitions and more. While traveling with Hurtigruten’s new exhibition ship, the MS Roald Amundsen, an international public will experience nearly 600 works of art created by emerging Norwegian artists, previous winners of the Queen Sonja Print Award and even some of HM Queen Sonja’s own works of art. The ship will travel to Antarctica, the Arctic and the Norwegian coast, and will have the ability to sail fully on electrical power. 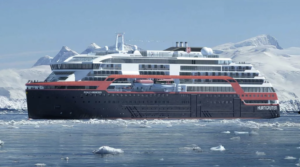 The MS Roald Amundsen is one of two hybrid ships being produced by Hurtigruten in the coming years as they work to strengthen their focus on sustainability. While Hurtigruten continues to build the next generation of expedition ships and the Queen Sonja Print Award Foundation highlights the next generation of young artists, this powerful alliance only seems natural.